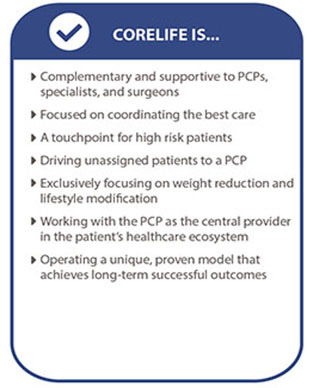 CoreLife is the trusted partner for PCPs, surgeons, and specialists, who identify patients needing weight reduction and lifestyle modification in order to improve their overall health, optimize a surgical outcome, or to prevent, impede, or potentially reverse a diagnosis. In 2019 CoreLife is expecting in excess of 250,000 patient visits, with 72% by physician referral. When PCPs identify overweight and obese individuals, CoreLife provides a trusted resource that previously did not exist. CoreLife partners with referring PCPs to provide patient reports for a comprehensive review of a patient’s health and progress. For any surgeon that determines weight reduction and management is necessary before a surgery (to reduce complication risk) or after a surgery (to avoid re-admittance and enhance outcomes). 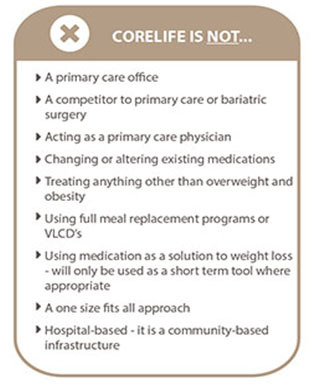 CoreLife can be bundled into the perioperative portion of the surgery. For any specialist that determines BMI optimization and lifestyle modification would help improve, impede or prevent a diagnosis. Physicians understand that obesity and lifestyle choices are at the root of many of the difficulties they treat. These physicians are living the overweight and obesity epidemic on a daily basis, but don’t have the time, infrastructure, or resources to provide ongoing treatment. 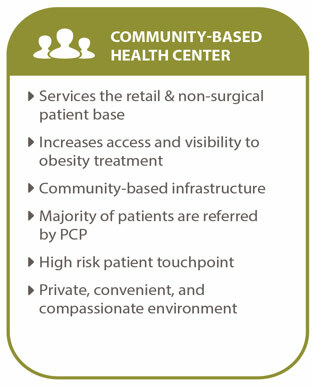 In response, physicians have sought out local partnerships and key providers within their community to address and treat the needs of their patients. For years, these physicians have turned to CoreLife due to the credible, high quality and innovative programs being offered to their overweight and obese patients. Since CoreLife operates on a local level, we are down the road and around the corner from the providers and patients that we support. Healthcare is moving away from previously-existing models based on episodic and acute care, and towards a focus on maintenance and prevention. Value is increasingly based on actual outcomes: impacted health and well-being. We know the factors that affect an individual’s overall health go well beyond medical interventions and genetic predispositions. It is estimated that nearly 75% of an individual’s health status is determined by environmental and lifestyle factors. Care management systems that cultivate collaboration among providers, patients, and families help optimize treatments and protocols to achieve better and more sustainable outcomes. CoreLife provides the first healthcare model that focuses specifically on BMI optimization and lifestyle modification in a singular, comprehensive, community based, center. 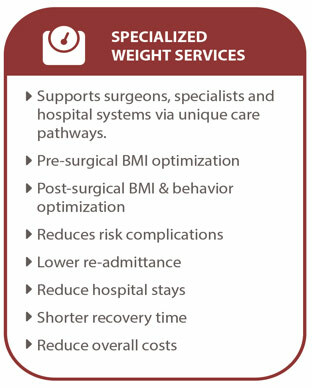 Interested in integrating weight management into your clinical practice? Effective weight management interventions utilize a lifestyle approach, one that integrates physical activity, nutrition, behavioral management, and gives attention to psychosocial needs. 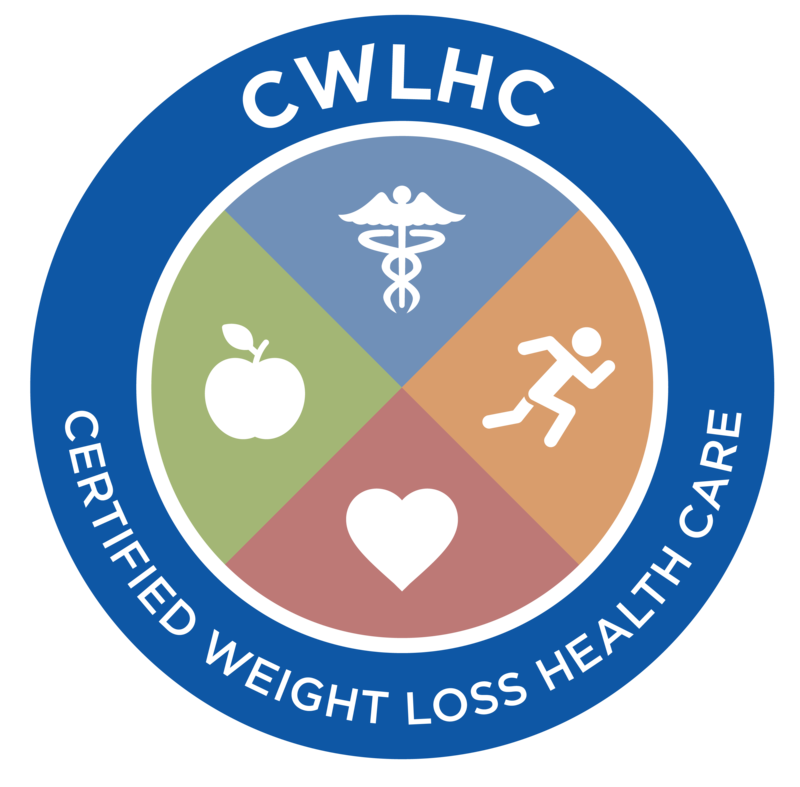 As a respected leader in weight loss healthcare, CoreLife works with Physicians and Health Systems to incorporate weight management strategies into clinical practice. How do you measure patient outcomes and success? Do you offer family programs? We have many patients who participate in the CoreLife program with their spouse, friend, children, parents, siblings, etc. It’s something that we highly encourage and discuss early on. We also find that patients who engage in the program with family or friends are much more successful due to the enhanced support and accountability system outside of our centers. Is CoreLife open to anyone? Yes! 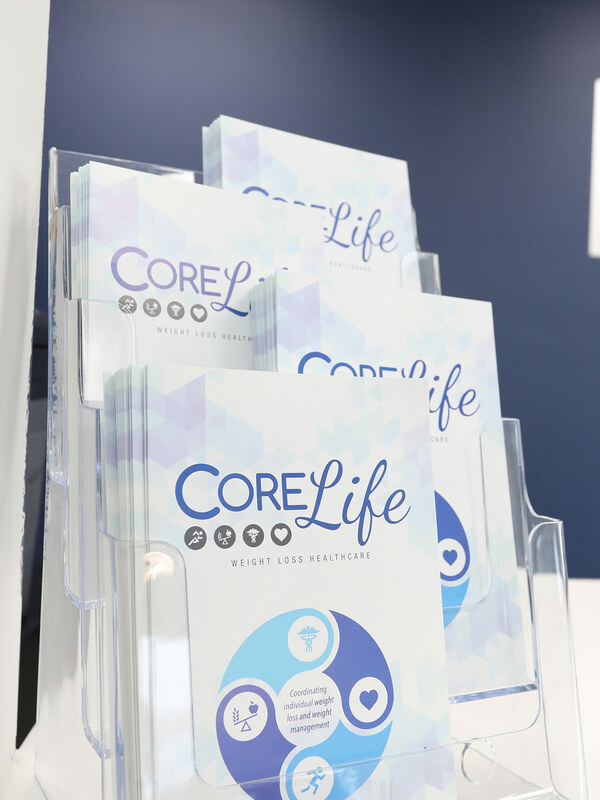 Most patients come to CoreLife from a physician referral. We welcome anyone looking to improve health through weight reduction and lifestyle modification. We also treat many patients that come to CoreLife organically, from word of mouth, a friend referral, social media, etc. What data can we expect to receive from CoreLife on a regular basis? Are we able to integrate any data into our systems? The level of data/reporting is determined by the requirements as established by the referring provider. We will provide as much data as the partnering healthcare provider prefers, on a detail centric or summary basis. Please describe how we will support the mental/emotional health of the patients. Counseling at CoreLife is delivered by all staff, with most being provided by Registered Dietitans and Behavioral Therapists (LCSWs). Having been trained in behavior counseling, our team also refers to internal protocol when supporting our patient’s emotional health. Once participants meet their goal, do they continue, or are there options/resources for transition? Maintenance is, in many ways, the most critical component. We understand that the single best predictor of regain is how long you can successfully maintain weight loss. We employ a free maintenance program consisting of physical weight check ins and consistent remote engagement through email, phone, and text. We employ safeguards to help catch potential regain and, if necessary, re-engage the patient into a program. Do you have programs for pediatric patients? We service pediatric patients on a case by case basis. Family programs are common and more likely than individual pediatric patients. Example of the typical staffing model. Which commercial insurance contracts do you already hold?